The gorge, Edmundova sout&ecaron;ska (German: Edmundsklamm), is located east of H&rcaron;ensko in the &Ccaron;eské Švýcarsko (Bohemian Switzerland) region of the D&ecaron;&ccaron;ín district of northern Bohemia. The gorge was formed by the river Kamenice (Kamnitz) and is the lowest of three gorges on the river. Its sandstone walls have a height of 50–150 m above the water level. The gorge was inaccessible until the 19th century. It was only in 1877 that a group of five adventurers managed to raft down the river. In 1898 Prince Edmund Clary-Aldringen, one of the leading aristocrats in Bohemia and owner of large parts of the area, decided to have the gorge developed for public access. That part of the river where no path could be built on its banks where made accessible by the construction of a dam that retained the water. Visitors could then take a boat ride up to the upper parts of the gorge. The gorge, also called Tichá sout&ecaron;ska ('quiet gorge', Stille Klamm), was named for Prince Clary-Aldringen and was opened to the public in 1890. In 1898 the Divoká sout&ecaron;ska ('wild gorge', Wilde Klamm) also was made accessible. Another popular tourist attraction in the &Ccaron;eské Švýcarsko (Bohemian Switzerland) region is the Prav&ccaron;ická brána (Prebischtor). Glass no. 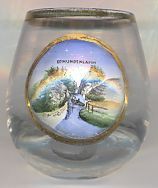 2973, labeled as a souvenir from the Sächsische Schweiz ('Saxon Switzerland' region in Saxony, Germany), shows a view of Edmundova sout&ecaron;ska (Edmundsklamm in German) [bottom right] and Prav&ccaron;ická brána (Prebischtor) [bottom left] as well as of Bastei-Brücke [top left] and Kuhstall [top right] in Germany.